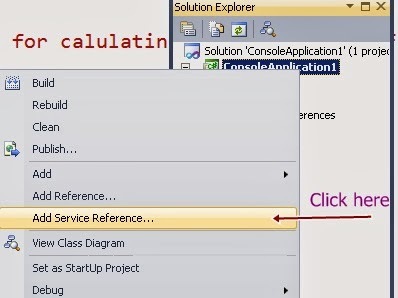 In our previous tutorials i have already explained How to implement WCF Services in asp.net application. Now i am going to call WCF Services from Console application as well as WindowsFormsApplications .I will call same WCF Services which i have explained previously.When you will understand the whole concepts of WCF, then you can easily implement the WCF Services in any application.It (WCF) is the full enhancement of Web services.You can easily know the differences between WCF and web services here. Step 2:- Open your visual studio --> File -->New-->Project -->Select console Application as shown below --> press OK. Step 3:- Now Add WCF Services Address (which already copied in step 5 ) --> press Go Button as shown below -->press OK. Note:- In Above program i have called each WCF Services Methods.I have mentioned each method call in comment section of the program.